Surface Tension: the art of Euan Macleod 1991–2009 is the first major touring exhibition of work by an artist considered to be one of the finest painters of his generation. Euan Macleod’s work has received critical and public acclaim, as well as major awards including the Archibald Prize in 1999, the Sulman Prize in 2001 and the Blake Prize in 2006. Surface Tension showcases the best of Macleod’s major works, sourced from the collections of public galleries, corporations and private collectors. It traces Macleod’s concentrated distillation of elements from both the Australian bush and the land of his birth, New Zealand. Visitors to this exhibition will witness the artist’s tense wrestle with duality – thick and thin pigments, Australia and New Zealand, father and son, absence and presence. 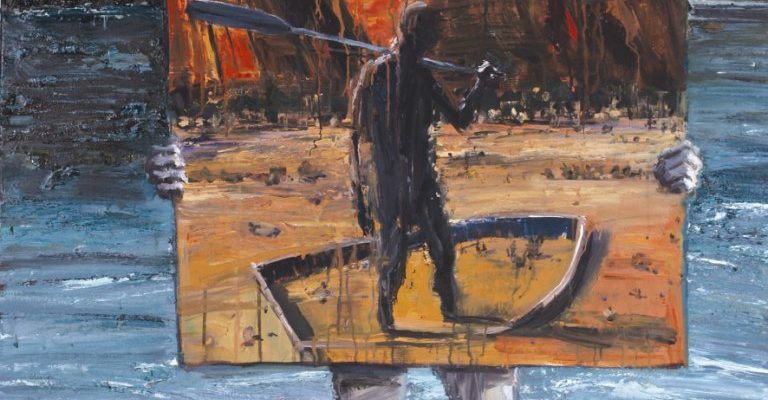 The striking, painterly quality of Macleod’s work is evident through his deft deployment of symbolic imagery which engages audiences in a range of issues including identity, alienation, displacement, security and mortality. Euan Macleod is represented by Watters Gallery, Sydney; Niagara Galleries, Melbourne and Victor Mace Fine Art Gallery, Brisbane. Surface Tension: the art of Euan Macleod 1991 – 2009 is a Tweed River Art Gallery touring exhibition, curated by Gavin Wilson. Downloadable education kit available here.